I’m just going to come right out and admit that when I first looked over Magical Marvelous Memorable Cookies I was skeptical, because I did not believe the world was in need of a cookie that involved granola. But the recipe’s author -- the ever reliable drbabs -- a certain food52 staffer hectoring me with the determination of a hunger crazed Killdeer to “MAKE THE COOKIES!!!!!!!! !” and the realization that I had signed up to provide the pre-worship feed snack for our congregation on a Friday night three hours before I had to be there combined to inspire me to give these cookies a whirl. What is deceiving about this cookie, which I figured would be mostly a newfangled chocolate chip thing, is that it’s actually quite delicate, more tuile than Tollhouse, with lots of crisp and snap. I am guessing this is due to its fairly high sugar content, made all the more so by granola and in my case the toffee bits. This is a fairly standard cookie method, with butter creamed and eggs and vanilla added next, your dry ingredients following behind, with a good amount of scraping down. Your mix ins come last. Our author tells us to form these and then fridge them but I don’t have room in my fridge for such falderal so I just chilled the dough right in the mixing bowl for 20 minutes. I used a small sized scoop to get these guys on the pan, which is faster than hand rolling. Drbabs wants you to cook these one sheet at a time, and I assume this is to prevent uneven cooking or burning. I was in a hurry so I did two sheets at a time and rotated them after seven minutes. You really need to watch these because they will burn if you are not careful, though I repeat, my toffee chips may be to blame. Please let them cool before moving them. The taste? Delicious. Sweet, delightfully crunchy, complex in this really sort of best-bakery-in-the-neighborhood sort of way. I placed them on the table at my temple and watched the grown men and women go crazy. One older congregant ate three. “That really is enough for me,” she chuckled as I looked on with delight. I am sure she doesn’t think I saw her stuff another into her pocket. You may want to add a little cinnamon, allspice, cardamom, or whatever you fancy. We didn't because we wanted the taste of the granola to come through. I love a versatile cookie. They also have the soft, pliable look that's soooo appealing. Yum. Hi all- I'm seeing notes about freezing the baked cookies but does anyone know how all fairs scooping the dough then flash freezing /bagging for baking off in the coming week? I've got granola, chocolate and cashew in my batch. These are unbelievable! I was finishing up radiation treatment and wanted to do something for the radiation therapy techs who had been so wonderful to me. When I saw this recipe I was happy to make cookies with granola added. Semi healthy for a health conscious group! I cut the sugar in half which resulted in a less crispy cookie but still very good. As I was leaving the facility one of the techs ran out to say thanks for the delicious cookies. Thanks to the kaiser group for first class treatment!! best. story. ever. thanks for posting. These are sooo great! Thanks for featuring this recipe. One batch I tried with my auto convection oven, but the regular ol' oven at 375 made the magic happen. I am making these for a friend for a birthday gift! interesting. i am so glad it worked out. OMG!!! These have to be some of the most delicious cookies I have ever made. I did not have any granola handy so I used oatmeal. For the "salty", I used some of my previously made "Olde Bay Chex Mix". The combination was amazing! This will now be my "go-to" cookie recipe. wow so were they a little savory as well? @drbabs' recipes are always winners! I finally got around to making a compost cookie of sorts. I've been making Milk Bar's cookies over the past year (never having made her compost cookie) and I love Christina Tosi's method of creaming the butter, sugar, eggs, etc.. Which came in handy for making a batch of these. I had about a cup of the graham cracker crumb left over from another Milk Bar treat. I had about a cup cinnamon granola that I make. To those - I added added Guittard chocolate chips and half cup of Sea Salt potato chips. I didn't add nuts because of the kids who don't care for them. The rest of the recipe stayed the same. Because I was using plugra, I decided to go ahead and use our Kitchen Aid and cream the butter/sugar for 2 minutes on med-high and then add the egg/vanilla for another 7 minutes on high. I've had messes using plugra before and was hoping if I got it right, I would have a real cookie, not a mess. I got the right consistency. Everything else folded in quickly on low. The dough was super tasty and held together really well. I did use a larger scoop I have so I had less cookies overall. I don't generally bake all the cookies at once - because they will last in the fridge/freezer awhile - and I love them just baked. They baked up perfectly! The sugar/butter held together. They were a HIT!!! The perfect combo of sweet and salty. i love the potato chips idea. people are having such fun with these! Momofuku's famous "compost cookies," they were certainly the inspiration, but those cookies are meant to be soft and chewy on the inside, and these are meant to be crispy and crunchy. Thank you, Jenny, for featuring this recipe, and thanks all of you for your sweet comments. This is oddly similar to Momofuku's famous "compost cookies." Having eaten many Momo compost cookies, I concur with the creator, drbabs. Her cookies are crispy and the flavors of individual ingredients seem to pop more. I like her cookies better. Cookies look excellent. But *falderal*? I had to look that one up. A quick search tells me that word hasn't appeared in the paper of record since 2010. 1. mere nonsense; foolish talk or ideas. 2. a trifle; gimcrack; gew-gaw. most fortunately the food52 folks don't make me adhere to times style! Interesting. I know it as folderol. And these cookies sound very similar to the Milkbar's compost cookies. I'll have to try the recipe. I'd like to bake a batch to take to friends, but will probably want to do so the night before. How do these taste the next day? Judging by how popular my g-f snack bags of pretzels are among the early trick-or-treaters in my neighborhood, I'd say I will be able to crush enough pretzels for about twenty batches of these cookies. Glad to hear they freeze well. I made these for a group event last night and they were the rage. No granola, but threw in some Life cereal, increased the nuts, and called it a day. 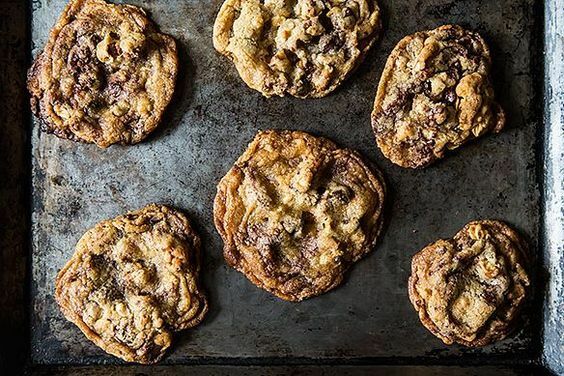 It's the perfect cookie - crispy yet with a chewy center. Thanks drbabs! Will these freeze well? I'm looking for something easy and good for this year's cookie exhange. I have complete faith in any recipe of Dr Babs! These are in the near future. Made these for Frankenstorm guests last night and I've never seen a pan of cookies go so fast. That might be because I had three. And why did I wake up with a cookie in my pocket? Smart move to ensure that you had one handy the minute you woke up! I'd be the woman stuffing another cookie into my pocket. Can't wait to make them. ps. jenny + cathy - hope you + your families are safe! If the power stays on, these will be mine. I happen to have some toffee bits, too. These cookies look and sound reeediculous!